Many of you have seen this photo in the news in the past few days. Apparently this past Tuesday a Virginia couple , Michaele and Tareq Salahi, crashed President Obama's state dinner honoring the Indian Prime Minister Manmohan Singh. The Secret Service was quite embarassed by the breach of security. 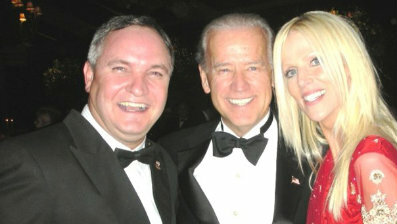 Here is the image in question showing the couple in a photo op with Vice President Joe Biden. But it seems there was at least one other unauthorized couple present at the party who were definitely not on the guest list. As far as security breaches go, this one looks to be just a little further up the food chain. In the famous words of Ricky Ricardo, "Lucy, you got some splainin' to do!!"